The most visited tourist cave in Europe is a place where the proteus or olm offspring are once again hatching. The cave railway has been operating at the cave for 140 years. Predjama Castle is located close to Postojna Cave and is the largest cave castle in the world. Postojna Cave is the only karst cave with a railway, which was built more than 140 years ago. The unique tourist train will take you to the underground network of karst corridors, galleries and halls. During an hour-and-a-half-long guided tour, you will learn about all of the most important karst features: the largest, 16-metre-high stalagmite known as the Skyscraper, the crystal white symbol of Postojna Cave – the Brilliant, the oldest underground post office in the world and the most famous underground animal – the olm or the human fish. Postojna Cave boasts incredible subterranean halls. In one of them, the largest live nativity scene in the subterranean world can be seen at Christmas time. More than 500 performers put on this Christmas show among stalactites and stalagmites. Thus far, more than 38 million visitors from all over the world have seen Postojna Cave. They began their visit at the departure platform of the unique cave railway. A 5-kilometre subterranean trail is available for tourist visits. The train has also been adapted for disabled access. It was believed that a dragon lived in Postojna Cave, and that the human fish are its offspring. The only European underground vertebrate and the largest underground predator can live for up to 100 years and can survive more than eight years without food. 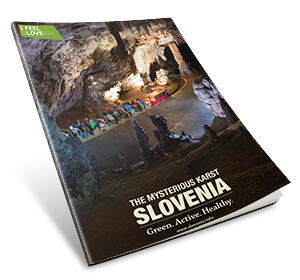 More than 150 animal species live in the karst caves of Slovenia, the olm or the human fish (Proteus anguinus) being the largest. Postojna Cave is the most biologically diverse cave in the world. One of its corridors features a vivarium, where you can learn about incredible cave animals and their stories. Standing out among them is the historic event in 2016, when people could witness "dragon" hatchlings coming out of olm eggs for the first time in the 200 years the cave has been open to tourists. In May 2016, the first observed hatching of the human fish took place in Postojna Cave. For the first time in the 200-year history of the cave, people could observe these incredible creatures hatch and develop. See why this birth is so significant. Predjama Castle is located in the vicinity of the Postojna Cave and is the largest cave castle in the world. For over 800 years it has been guarding a rock face, 123 metres high. Mysterious underground tunnels connect it with the cave directly beneath. The castle, which has also been a film location, offered refuge to its legendary owner Erazem Predjamski in the 15th century. This robber knight resisted a siege for over a year in his castle with its incredible appearance and location. Visitors can take a bus between the Postojna Cave and Predjama Castle in order to see both of these attractions. Golf courses in Slovenia are located amidst idyllic surroundings and are among the most beautiful courses in Europe. They are set in typical landscapes on the edge of the Pannonian Plain, among vineyards and rolling hills, below Alpine summits, and in the idyllic karst landscape. You will love the wonderful green nature, crystal clear waters and the amazing wonders of nature. Find your inspiration and relaxation in the idyllic environment of green Slovenia. Also visit museums that house the greatest treasures of Slovenia. Marvel at the special features of the landscape in protected nature areas. In the Karst, which lent its name to all karst phenomena throughout the world, you can also learn about the special features on the land surface, and not only those found in karst caves.